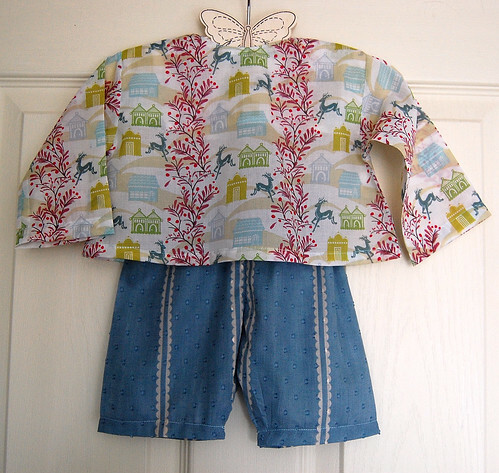 Smock and trousers, originally uploaded by indiaeden. My last three babies were born at home, so I've never needed a coming home outfit for them. This little baby will be born in hospital and Oh how I hope he/she'll be coming home. Maybe I should've waited to make this outfit. Maybe until after the anomoly scan, until we know baby is ok, or until we know the gender. Or maybe I shouldn't have made anything at all. I like to make, it's what I do, it's when I feel most calm, it keeps these too empty hands busy. I don't regret making any of the little things I made for Florence, but I know if this baby can't come home with us, I will regret it if I never made anything. We only regret the things that we didn't do - how true that is! I love what you have made Jeanette, you are so incredibly talented. Oh that outfit is so beautiful! I wish I had the skill and the time to make such wonderful things for my daughter. I've only made her a few things and I'm working on a quilt that I hope to finish before she completely grows out of her favorite baby blanket. But I never made anything for the baby I never met. I don't know why but I think I thought I'd have more time later. I don't know, but it does make me feel bad. I'm impressed with what you do and if I were you, I'd never stop. You're a good momma. 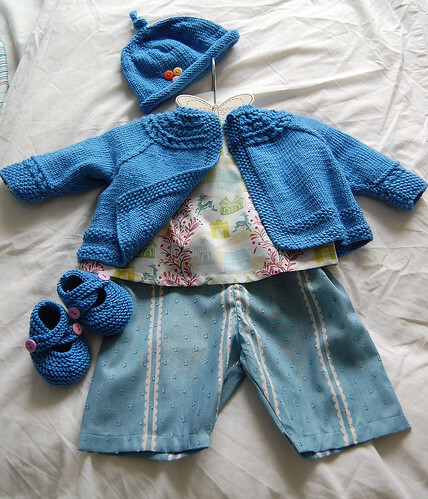 What a lovely outfit... keep sewing, knitting and hoping! Well done for driving the car. What a lucky little baby to have such a clever mummy waiting to hold her/him. Whatever happens, you wont regret making such a gorgeous outfit. I can't wait to see your baby in it. 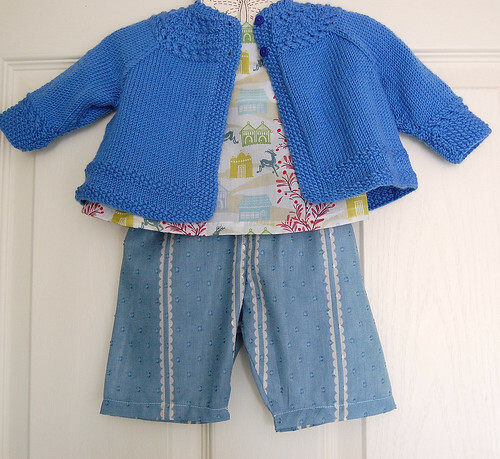 That is a beautiful outfit (for a girl or a boy) I can't wait to see your baby in it. That is a truly beautiful outfit! Your talent never ceases to amaze me. Well done with the driving, I know how hard it has been for you, but look at how far you have come. That's really lovely Jeanette. So pretty. I love the colour of the wool especially. You sound a bit more at peace now that you've started making things for the new baby. Maybe that's just reading (too much) between the lines but that's how it comes across from your posts. The outfit is gorgeous, I love it all together, specially the cardigan and bootees and hat. How about another give away?